Cutting the ribbon at a new business is one of the nicest parts of my job — I get to welcome entrepreneurs to our community and thank them for their confidence in New Rochelle. It’s a quintessential mayoral duty, almost a cliche, and sometimes I feel like I should wear a top hat and sash to complete the picture. But there is at least one constituency that couldn’t care less about ribbon-cuttings, having become over the years entirely jaded to these frequent events: my kids. They greet the news of a ribbon-cutting with a big yawn. For those who don’t know, Escape Rooms feature a series of word-based, mathematical, or geometric puzzles that must be solved within an hour in order to exit a sealed room. There’s usually a narrative overlay to set the mood: you’re a magician, or a treasure-hunter, or a counter-terrorism agent, or some such thing. Anyhow, Owen is an Escape Room fanatic. (When we had a short father-son trip to Baltimore a few weeks ago, visiting the local Escape Room near the Inner Harbor was Owen’s single non-negotiable demand.) Before now, the closest Escape Rooms were in Manhattan or at the Palisades Mall in Rockland, so this new addition to Main Street will be warmly welcomed in the Bramson home! Plus, it’s another great draw for downtown New Rochelle. 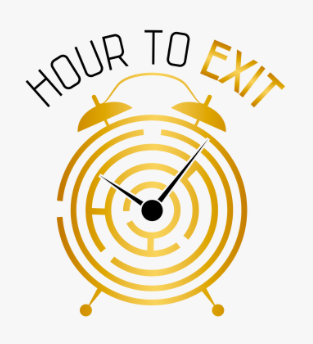 Learn more about Hour to Exit here.